I've included this game purely because it is so bad! Typical 'figures on springs' game, but its size and the positioning of the figures make it a ridiculous waste of time. The figures are all in their own half - so every goal is at least a 50 yard screamer. The players are about an inch away from each other too! Small crappy game. Players all in their own half. Tiny pitch. The worst game ever? 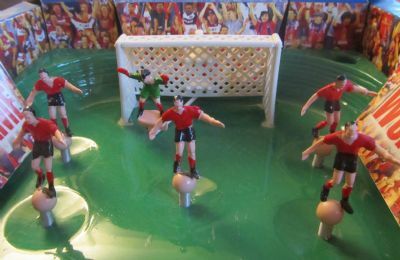 Figures on springs placed in recesses on the pitch. The fan shots are from a Chicago Fire game. Six a side game with all players being placed in their own half. Not much space between them either. The players all appear to be concentrating on keeping their balance on the balls! 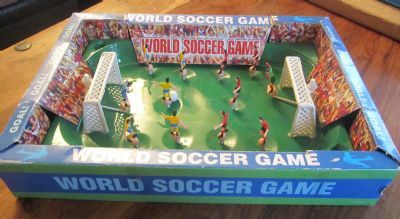 Not sure the dimensions of the game are quite right! 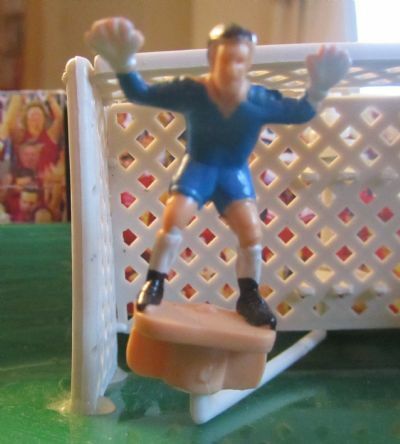 Attack of the 50 foot keeper.